We're finally home. Got back Wednesday afternoon. We're so freakin' tired we feel slightly more insane than usual. We spent three days/two nights on the road instead of the standard two and one. On both nights, one in Ashland (home of the Shakespeare festivals of southern Oregon) and one in Portland, the cat whined and cried most of the night away. We're old softies, so we petted and tried to talk him through it. He became increasingly more cranky and intolerant of us as the hours in the truck and the motel nights wore on, until he was finally reduced to hissing at us or simply nodding in abject resignation. The reason we pushed poor Bonsai to his traveling limits (instead of pushing on and heading straight for home) is so we could spend one night in Portland with our 31 year old nephew Ross who was in a horrific car crash on February 10th. 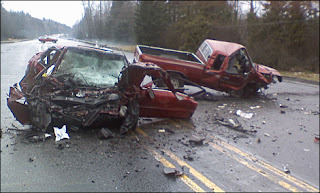 He had been driving up to the mountains on a lovely Saturday morning to go snowboarding, when at 10:00 am, two people in a Honda driving back towards Portland crossed the lines and hit his pick-up truck head-on. The Honda driver and her passenger were both killed. Ross and his passenger survived. They had severe, but non life-threatening injuries. He has a broken jaw, broken clavicle, broken vertebra, and a cracked sternum. He will not be able to eat solid food for another six weeks. 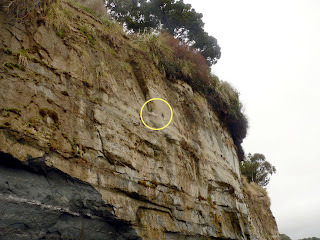 Still, he knows he is lucky to be alive. So how could we drive through Portland and not stop, spend the night, and take him, his wife and his mom (our sister-in-law who traveled up from Mexico) out to dinner? Ross sipped some very spicy Thai soup through a straw and later had some ice cream that was blended just for him to liquid perfection with milk. He showed us photographs of what he looked like just 16 days ago. His recovery is truly remarkable. So, we're home. The yard looks to be in the grip of winter still. The mice have moved into the garage. The garden is weedy. The small backyard lawn is literally covered in mole hills. We will try not to make mountains out of it. We have our work to do. My mom called the other day to tell us, "you haven't updated your blog in a while." I know. I know. We have had nothing to say. We're waiting for a series of storms to finally pass through before we hit the road for our 900 mile journey north. It's hard enough traveling with a cat on any day, but the thought of driving slowly with him through winding highway mountain passes in winter snow just seems insane. So we wait. The biggest storm is expected to hit Saturday night. We're thinking Monday will be our first opportunity for clear skies. 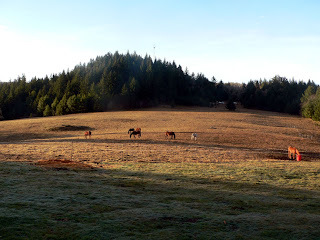 It takes a little while after the sun has risen for this 15 acre pasture to fill with light. Then it stays lit all day. If you click on the photo you'll see the last patch of snow up by the tree line. The ranch is at 2200 feet altitude. The air was clear and bright. At night the stars were layer upon layer deep, and the darkness between was limitless. 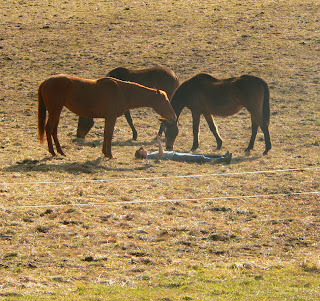 There are seven horses on Indigo's and Sky's ranch. Indigo gives each of them her deep and undivided attention. They seem to have a symbiotic relationship, she and her horses, learning from each other the secrets of their respective species. It is a parent's joy to watch a child come into her own. She is completely on the turf of her dreams. From 4H to 40 acres. She has come home. it was a wonderful realization for me in the middle of the night that we were in our adult daughter's house. i am a proud father. we had not seen her and her hubby for a year and a half. far too long. part of why we are leaving port townsend to move closer to family. i was teary for a hundred miles after her goodbye hug. like many men, i am not so good at describing my feelings, but i can say with certainty that it will never again be so long before another visit no matter where we live. and our resolve to move is even doubled by our love for our other daughter in san francisco. This solar collector supplies the three-bedroom, two bath house with enough power to light the lamps in all the rooms. It also runs a 12 volt refrigerator, fills the house with music from an iPod, heats our mattress pad, and any other small appliance we might deem absolutely necessary. There's a diesel generator that runs the washing machine (and dryer on days when there's not enough sun to line dry), and a propane oven and stove. We did not miss having a TV or microwave. Although, I suspect that another set of panels would have made the house an equal to the energy monstrosities considered requisite for the modern American life. Our desire to sell the Port Townsend house has been renewed with even more vigor. 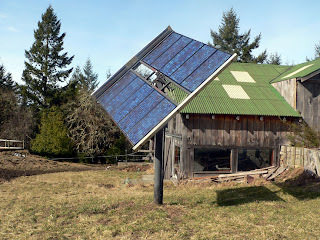 We could live quite easily off the grid in Humboldt County. In fact, it felt like second nature already. With high speed internet, we would be home. We're planning our trip back to Port Townsend for some time next week. We'll keep you posted. By the time you read this, we'll be on the road headed up to Humboldt County for two days to see family. We'll probably be without internet connection until Tuesday, so I thought I'd get this Monday post up early. The cool part about this trip, besides seeing Indigo and Sky (Roger's middle daughter and her husband), is that they are renting a 40 acre horse ranch in the part of California we are thinking about settling in, after we sell our place in Washington. 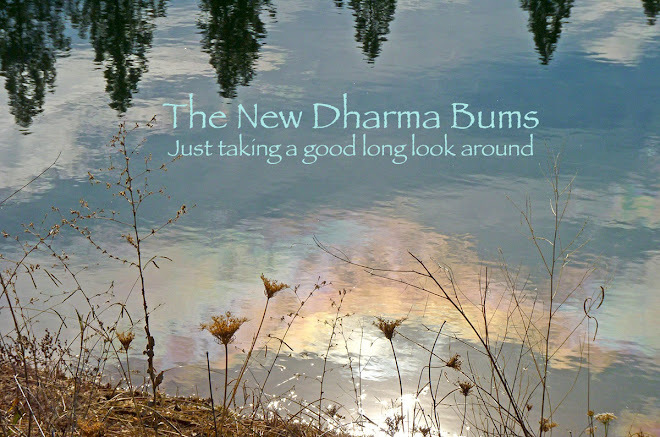 So, we go with plans to take a good, albeit short, look around. Here's something you probably thought you'd never see. Why would anyone post a photograph of their bed? It's to set the scene for the story I'm going to tell you, of course. 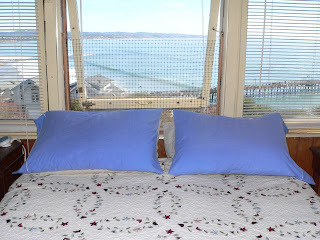 Here's where Roger and I sleep in the old beach house. We always keep the window above our bed as wide open as it will go. We like lots of fresh air, even in winter when the temps dip into the 30s here. We don't mind, we just pile on more blankets. I think you can see that there is plastic netting in the window. That's to keep the cat in. He's not very agile, and the bedroom is on the second floor, with the roof of the extended first story just below, so we didn't want provide an attractive nuisance for him. He does like to sit on my pillow (the one on the left) and look out the window during the day. At night he mostly sleeps curled up at our feet, but lately he's been sneaking up beside me and scrunching down next to my pillow to sleep. Poor Roger gets the brunt of it because I move over to let the cat have room. I often wake in the night and find Bonsai sitting beside me staring out into the darkened night. I suspect he is hearing and seeing things that just escape my lowly senses. I pet him and go back to sleep. The other night I awoke to Bonsai hissing and spitting up a storm, right next to me. I couldn't believe the racket. So, I looked out the window and there was a raccoon staring right back in at me. He wasn't more than a foot away. I said, "Go on, get out of here," and the raccoon took off. I was shocked to find Bonsai holding his ground like that. It's not a behavior we expect from him at all. We've heard him respond like that to cats that invade his territory, but a raccoon? That seemed very unusual. We posted this raccoon post some time ago, about how a raccoon used to come in through Bonsai's cat door when we lived in our old house in Santa Cruz. Bonsai sure didn't take a stand for territory then, and the raccoon was in the house eating his food. He hides from dogs, bobcats, and other raccoons up in Washington. So, we wonder, why did Bonsai not just retreat, jump off the bed and hide? What do you think? We took another longer hike in the Pogonip on Saturday with my twin brother and SIL. It was hot. Really hot, like 72 degrees. That's rather balmy for February even on the central coast. The shadowy parts of the trail offered great respite, and even a bit of a chill, which quickly warmed up when we broke out into the sunny coastal prairie again. It definitely felt like springtime. There were Monarchs and even a Mourning Cloak flying about. 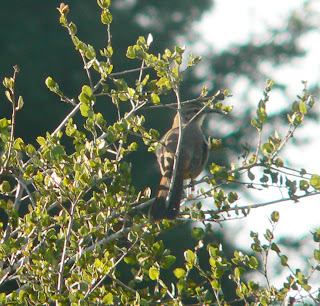 We saw a California Thrasher for the first time. 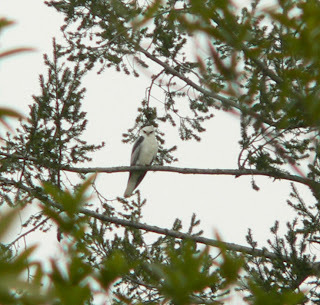 What a beautiful bird, with a truly melodious song. Well, that's it until Wednesday. We're off for Humboldt County, through San Francisco, over the Golden Gate, the Redwoods, and Eureka. See you when we get back. Roger and I are in severe self-editing mode. It's very hard for any words to make the cut. Each idea is slashed with giant red pens of "who cares about that?" Lately all the birds have been far away. Too far for even a 12X optical zoom to capture with any clarity. I fool around with the 48 digital, and the results are not impressive. Still, I think they say something about the moment. The meadows are vast. The birds hug the tree line. We are small in the world. 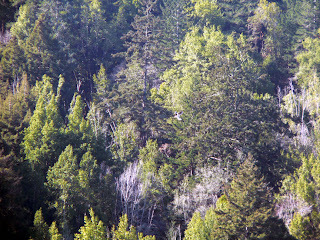 There's a hovering White-tailed Kite in the above photo. Do you see it? Roger says the meadows aren't too big for our eyes to see the kite hover or the red-tails sailing in the vast expanse. Only too big for our technology. We've been hiking the 640-acre Pogonip. There are places where I half expect a mountain lion to leap from its hiding place on the limbs of snarly old oak. A jogger runs by us, and I think, "Oh good, there's the prey. Prey always runs." I walk on slowly feeling much safer. Twice in the past two weeks, young mountain lions have been found in our local vicinity. One dead by the creek, one killed in a backyard after it took a chihuahua up into a tree. 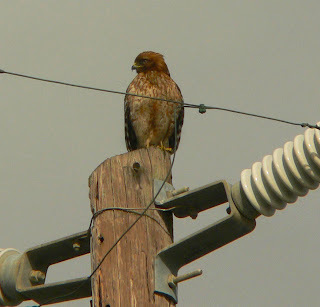 Our true neighbor the Red-shouldered hawk came by the other day. His fierceness seems belied by the soft feathers lightly fanned in the afternoon breeze. Reminding us to keep the wind at our backs. A pole is not a tree, but it will do. 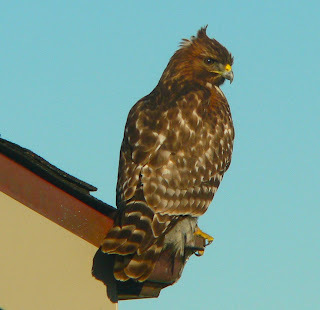 There's an interesting post over at Via Negativa about a Red-tailed hawk on a 40,000 student campus. The Buteos have figured out how to live among us. Not many of our fellow citizens actually notice them, but they are everywhere. We are purposefully not saying anything about politics right now. It is interesting to be in California, but to not be a resident or a registered voter, and therefore feeling immune to the media hype and onslaught. It is a complete and utter relief to not have to choose at the moment. A luxury not shared by our neighbors and family. To them we say, good luck and thanks for voting. We closed our laptops, turned off the radio, and went for a hike. 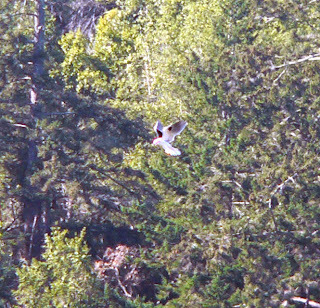 We saw our first White-tailed Kite, a very dramatic and beautiful raptor. 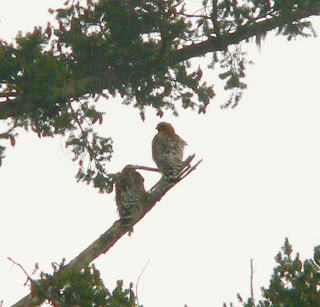 The whole time we hiked the hills and redwood forests, Red-shouldered hawks called and cried to each other. 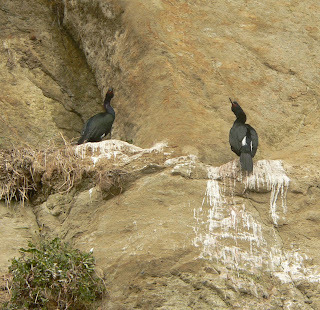 Their ongoing flight and song made us wonder if perhaps we were privy to a wild mating ritual. Despite the cold, gray weather and a sky not suitable for photography at all, we had a fine walk in the woods. We saw signs of spring everywhere.